10's of Thousands of race fans jammed the Oakland Alameda Coliseum for the 5th round of Monster Energy AMA Supercross on February 3rd. What a night it was, with sunny skies overhead and unseasonable warm weather, had the makings of a night to remember. For Adam Enticknap, the road to success began months prior to Saturday nights race. 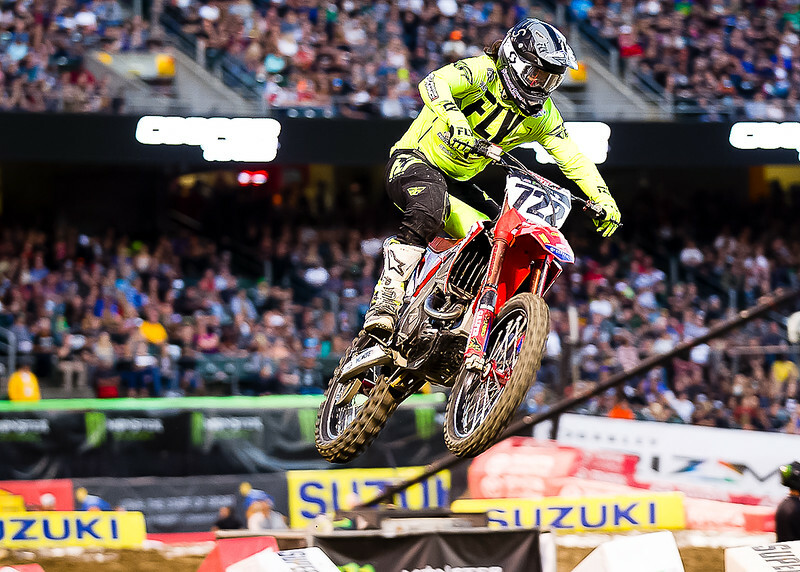 Starting in October both Adam and younger Brother Tyler trained full time with top series contenders Ken Roczen and Adam Cianciarulo at the nearby Los Alomos Supercross track, a huge advantage for both. Lap after lap with continued training at the Gym, served more as a boot camp over the course of the several months. The hard training regimen provided both with renewed focus and determination have proved very beneficial for the Lompoc AMA Pro Racers. 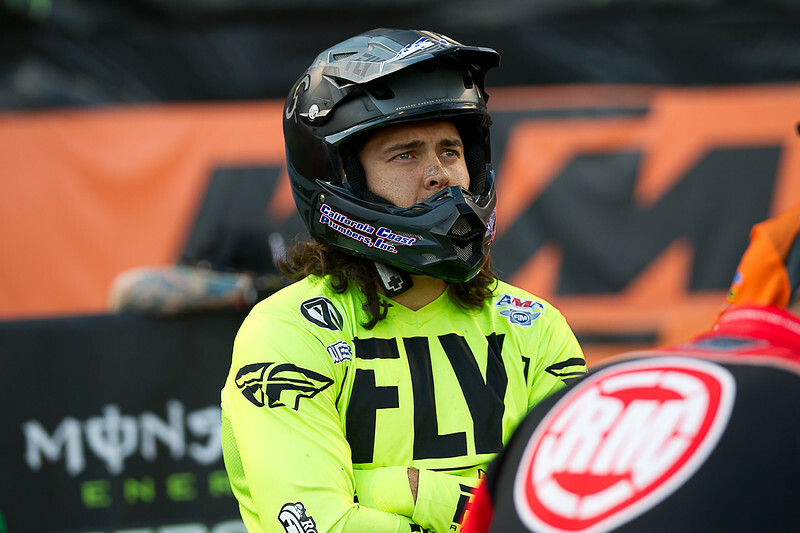 Adam meet his carrier goal at the first round at Anaheim with a convincing heat race placement to advance directly to the Main event. This was key as there are new Racers vying for the 22 man Main Event gate. Adam has continued to advance to other Main events and in doing so, scored championship points. Tyler will unfortunately miss this round and several other races as he recuperates from an earlier injury. He is expected to be back racing with his Brother in 4 to 6 months. Adam came into the night feeling really good. But during practice the ruts in the track became really gnarly and deep, this is were Adam had some struggles as the track got rougher as the practice sessions continued to reshape the track. One section after the dragons back going into a rhythm section he lost many a second and a half to Guys he normally rides with. 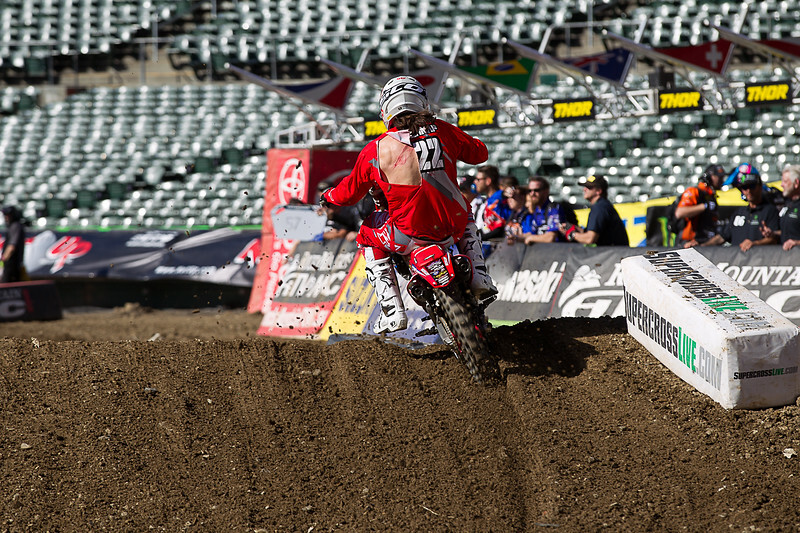 Adam was seeded 14th in the 20 man 450SX in the 2nd heat race. The gate dropped and Adam got his Honda 450 around the 1st corner clean and in good shape and after one lap was in 8th place. The battle for several laps took place as Adam was fighting for the last transfer spot of 9th place but didn't quite keep it. Not discouraged the Last Chance Qualifier was just moments away. He finished 11th in his Heat Race. Due to his overall finish in the Heat race, placed Adam with the 4th gate pick for the LCQ a nice advantage. Being that only the top 4 Racers advance to the Main Event, the start was very crucial. Adam didn't quite nail the start and found himself mired in 11th or 12th place, as he put down some fast laps times he charged to a 7th placed finish, making aggressive passes as he raced. His lap times were that of the top 4 riders and he just needed to be out front on the start. His start was good in his heat race and acknowledged you have to hit the starts every time as the competition is fierce this year. 250SX top 3 finishers were Aaron Plessinger, 2nd place was Joey Savatgy, 3rd spot went to Justin Hill. 450SX Winner was Jason Anderson, 2nd place to Ken Roczen and a season best 3rd went to Blake Baggett.